Play College Sports | "Hey, Mitz!" You’re my Hero, Tara VanDerveer: How to achieve Goals, play in College! If you ever needed guts in sports, I know a coach who will pull it out of you. One of my role models and college coaching heroes is Tara VanDerveer, Director of Women’s Basketball at Stanford University. TARA is a FORCE. And her coaching staff, Amy Tucker, Kate Paye, and Tempie Brown, are the best! Below, I share TARA’S LESSON on how to reach your goals and prepare to play college sports. READ CLOSELY if you want to play in college. One of my colleagues at Stanford [in the 90s], Tara VanDerveer spoke to my team (I coached Stanford W. Gymnastics) on competing under pressure. Her talk was complete motivation. 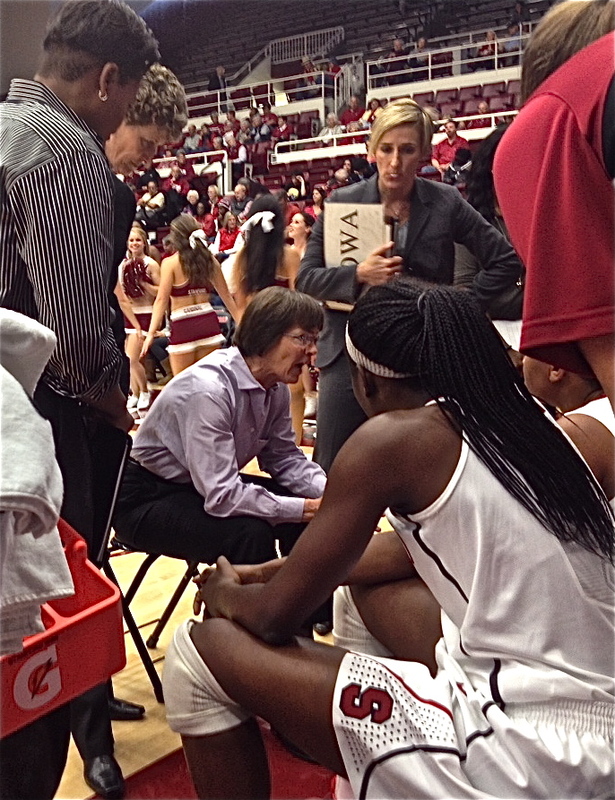 Tara at her best, instructing and inspiring her Stanford Basketball Team against Vanguard, 11/3/13. Tara continues to inspire! Here are Tips for High School Athletes. On March 2, 2013, Tara VanDerveer in conversation with my basketball-daughter, McKenna. I am in deepest gratitude. Tara, you were generous to give your time. I sat next to my daughter in the front row in a near-empty Maples Pavilion at Stanford University. The Stanford players warmed up on the court. Then Tara appeared, walked over to us, and greeted us warmly. For the next 30 minutes, I listened to one of the best basketball coaches in the world give tips to my lanky, high school, basketball-playing daughter, McKenna. I caught myself nodding and felt myself smiling. I love this kind of talk! McKenna was fully engaged. I asked, “Is playing club basketball important? “The best players play club ball,” said Tara. She suggested looking into a strong club where McKenna lives in Orange County. 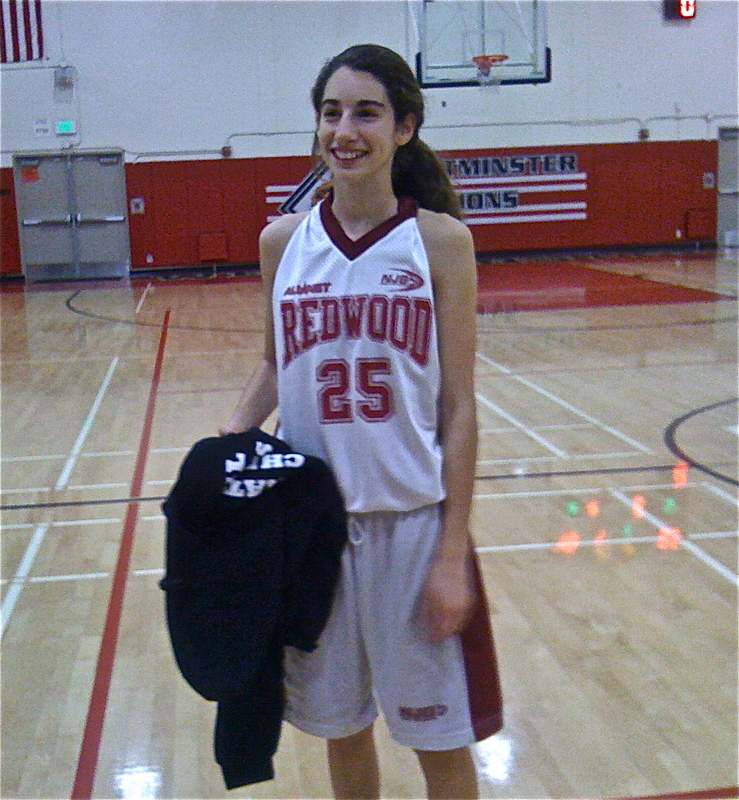 McKenna in 2012 after her NJB team won National Championship in Orange County. Tara spoke with authority and her presence was all grit. I felt energized and I think McKenna was, too. I kept looking at McKenna as she looked up to Tara. “Can you stay and watch practice?” asked Tara. “Yeah, I can stay,” said McKenna. Tara walked onto the court and began to coach her team. After 5 minutes and her team was in action, she looked over at McKenna (we were still front row, about 30 feet away). After the practice, the entire Stanford Women’s Basketball team walked around to McKenna and I, shook our hands, one-by-one. Each player said Hello and introduced herself. This was amazing, to say the least. It felt like: WELCOME TO STANFORD! Tara’s words injected motivation into McKenna. You HAVE to be bold to reach your goals, go the extra mile, be absorbed in your dream, and do the work. It’s ALL YOU. Finally, it doesn’t matter if you play for Stanford or a local college, Division I, II, or III. The point is GO FOR IT ALL THE WAY. Do everything you can to make your dream come true. Tara VanDerveer was recently selected as the newest recipient of the John Wooden Legends of Coaching award. She is only the 3rd woman to be chosen. Ceremony will take place in April 2014 in Los Angeles. Congratulations, Tara!!!! Read about it here: Tara receives Legend award. Tara VanDerveer – for highest standards in coaching and personal integrity.